One of the more common questions about garage floors is how to fill contraction and expansion joints. In particular, many want to know if you can fill the joints in the garage floor before applying an epoxy coating. Others want to know if you can fill the joints before or after a sealer is applied. 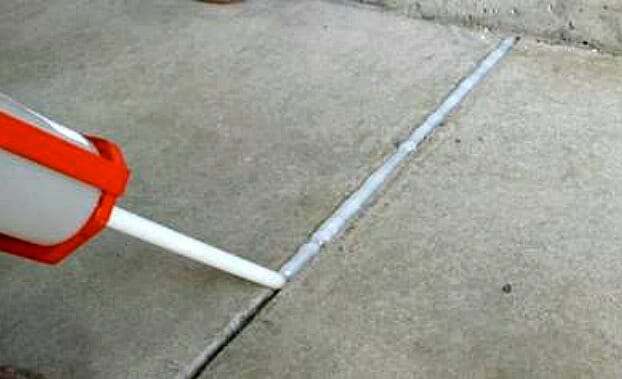 What about sealing the expansion joint between the garage floor and the driveway? We will answer all these questions and more, as well as discuss how to fill expansion and contraction joints in your garage floor. But first, you need to understand the difference between these two joints because it can determine which type of joint filling materials you use and why. In a typical 2-car garage, contraction joints usually look like a big plus sign that divides your garage floor into what appears to be four separate slabs. These joints (sometimes called control joints) are the deep V shaped grooves that run from one end of your garage floor to the other. Some concrete floors may have saw cuts as a contraction joint instead. Saw cuts are usually a minimum of 3/16” wide and 1” deep. Because concrete slabs will crack with expansion and contraction, these joints create a weakened line in the concrete that encourage cracks to follow the line within the joint. This helps to discourage cracks from following a more resistant line across the surface of your garage floor. You can see the cracks within this “V” shaped contraction joint. Expansion joints (sometimes called isolation joints) are joints that separate one slab of concrete from another and can be at a minimum of 1/2” in width. They are commonly filled with a compressible fiber board material. The joint between your garage floor and driveway is a good example of this. You can see the fiber board in this expansion joint that separates the garage slab from the driveway. Many times the garage floor is poured independent of the home foundation. When this is done, there is an expansion joint that will run at the perimeter of where the garage floor meets the house foundation. In simple terms, expansion joints help prevent adjoining slabs from damaging each other when they expand and contract. 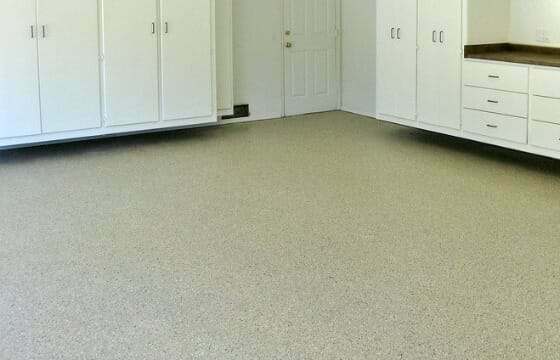 When the time comes to paint or epoxy coat the garage floor, many people want to fill their contraction joints in order to have a seamless looking floor. So, is this advisable to do? Well the answer depends on what material you use. When your garage floor expands and contracts with temperature changes, it can create movement (very slight) within the contraction joint. This is why there are cracks within the joint in the first place. If the joint is filled with a solid material that does not flex and then is covered with epoxy or paint, you have just created the potential for the crack to telegraph up through the coating. The reason for this is because you have a solid seamless coating which does not flex (epoxy) that is bonded to both sides of a jointed surface (concrete) that can move. As a result, you can create a break in the surface of the epoxy right above these joints if they are filled. Though the chance of this happening is not great, many professional contractors will not warranty an epoxy coating for cracks where the owner has asked to have the joints filled. Most contractors will fill the joints if asked, but they will warn you about the possible problems. If you want to fill your contraction joints, the key is to use the proper joint filler. The best material to use is a 100% solids epoxy filler or polyurea filler with an elongation rate (flex %) much higher than that of the coating you are using. It will cure to a hard solid that is sandable and will flex slightly underneath your epoxy coating if the joint moves in order to prevent cracking. This flexibility also prevents the filler from pulling away from the concrete as the floor expands and contracts. These qualities help tremendously to keep the paint or epoxy coating in one piece and not crack. 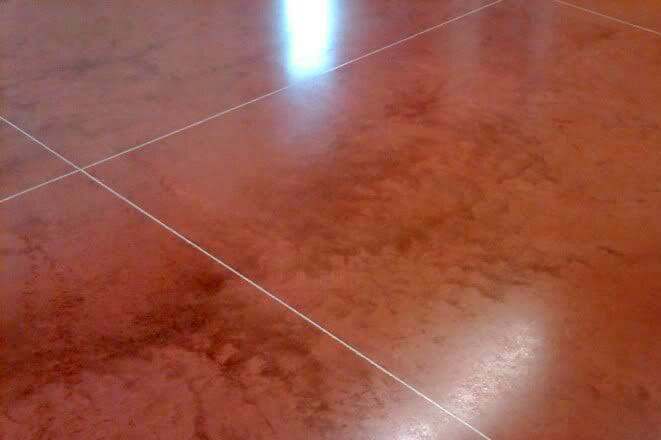 Most of these special joint filling compounds can be found online from your favorite concrete floor coating vendors. They are not cheap and home improvement centers do not carry them. There a few different products we can recommend. The first is a 2-Part 100% solids epoxy gel by Legacy Industrial. You mix the two components together and then fill in the joints. They also have a 2-part polyurea crack filler that works extremely well. It works great as a crack filler also. We did an article on it here. Another great source is Garage Flooring LLC. They have a few different types of joint fillers depending on what the job is. You can find them here. We recommend that you talk with them first to learn which is best for your project. Application of these joint fillers is not hard and requires little preparation of the joint other than making sure it is clean. If you have saw cut contraction joints, we recommend that you fill them first with a foam backer rod or silica sand so you don’t use as much filler. You want to leave approximately 3/8″-1/2″ from the surface. If you have “V” shaped contraction joints, the foam backer rod will not work well. Silica sand is a better choice. Both the silica sand and foam backer rod can be purchased from your local home improvement center. When using foam backer rod, make sure it’s approximately 1/8” wider than the joint. If your joints have cracks in the bottom of them, the backer rod or silica sand will also prevent the filler from slowly sinking into the cracks and creating low spots as it cures. Note: Backer rod floats. It must be wedged in the joint to keep it from floating and to create a barrier that blocks filler from seeping past. Once the joint is prepped, follow the instructions of your product of choice and fill the joints up. Make sure you don’t have any low spots or you will have to go over them again. It helps to use a putty knife to force out air pockets and to remove excess material. Once the joint filler has cured, you will need to grind the joint flush to create a seamless surface to paint or epoxy over. The grinding of the joint is important because some garage floors with the deep V groove can be lifted at the edges of the joint. This happens when the surface of the slab cures and contracts quicker than the rest of the concrete and pulls up the edges. If you apply the filler but don’t grind it smooth, your joints will telegraph right through to the surface of your coating and become visible. Contrary to what some people recommend, do not use latex caulk or water based crack fillers. Latex caulk and water based crack fillers are too soft and will slowly shrink. As a result, you will end up with slight depressions that outline where your contraction joints are. Additionally, the coating will crack if you have rolling toolboxes, jacks, creepers, or other heavy objects that move across the joint. This happens because these fillers are too soft. Sometimes the contraction joints in a garage floor and the expansion joints around the perimeter of the floor can be very wide and collect a lot of dirt and debris. This can create an eyesore for some people plus make it more difficult to clean them out. The same can be said for the expansion joint between the driveway and garage floor. You can always fill these joints in your garage floor after an epoxy coating is applied. It can also be done after clear sealers, stains, or other floor treatments are applied as well. Not before. The easiest solution is to fill these joints with a self-leveling polyurethane joint sealer/filler. These are a 100% solids polyurethane which means that it will not shrink as it cures. 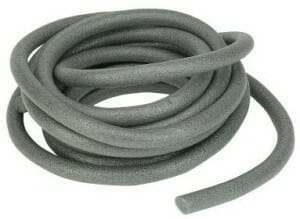 They are gray in color and applied with a calking gun. These type of joint fillers are inexpensive and can last for years. They also do an excellent job at sealing the joint from moisture. The material is flexible and somewhat spongy feeling after it cures, yet strong enough to drive vehicles over. Most are not paintable. 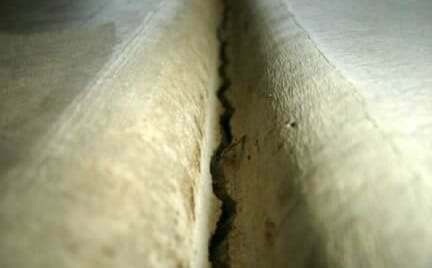 Prep of the joint is the same as before, however, do not use sand to fill up an expansion joint. Expansion joints need the material withing the joint to be compressible and sand is not. It can be used though if you are just applying a thin layer over old fiber board to prevent sealant from leaking through. It is also extremely important that the concrete is bone dry before application or it will not adhere well. For expansion joints it’s important to remove any old filler using a utility knife or grinding wheel. If the joint is filled with fiber board or felt, be sure to remove any of the material in the joint that is protruding past the surface of the concrete. 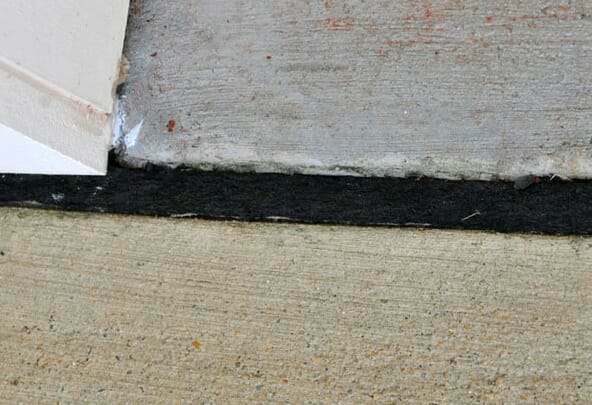 If the fiber board in an expansion joint is missing or deteriorated, you will want to clean out the joint and use backer rod within the joint before you apply the joint sealer. Do not place it more than than 1/2″ deep. Because these joint fillers are self-leveling, the viscosity is similar to honey. As a result, they will seek out any low spots along the joint. So be prepared ahead of time for any areas where the sealer/filler may want to run out of the joint. Once applied, it skins over in an hour or two and completely cures within 3 to 5 days. You need to wait at least 24 hours before driving over a freshly filled joint. Sealing and filling your contraction and expansion joints for a garage floor is not difficult. The key is to use the proper sealer or filler depending on the intended purpose and what type of joint it is. Just remember that expansion joints should always be sealed and filled with a flexible joint sealer and never be epoxied or coated over. Contraction joints can be filled in the same manner after a coating or sealer is applied. 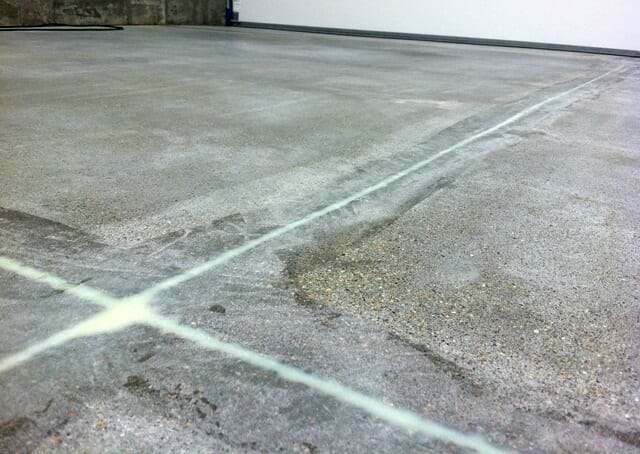 Nevertheless, if you want a seamless looking epoxy coating, contraction joints must be filled with a specialized epoxy or polyurea joint filler that cures hard, but has a high elongation rate for flexibility in order to prevent the garage floor coating from cracking at the joints. I goofed while prepping my garage floor for an epoxy coating by reversing your recommendation for filling the expansion joint. I first filled the joints and some cracks with Quikrete’s FastSet Concrete Crack Repair (rapid cure 2-part polyurethane). Is this an acceptable material to cover with a solid epoxy flooring product? Or do I need to grind it out and redo it? Hello Matt. That material is fine for the cracks. You can grind it flush and then coat right over it. Contraction joints on the other hand need something with an elongation rate (flex) of 10% or more. This will help to prevent the coating from cracking if the joint moves at all. The Quikrete data sheets don’t state what it is. You may want to call their toll free number to verify. The coating will still stick after you grind it flush, you just run a much higher risk of a crack forming over the joint if the elongation rate is not high enough. Thx!! Another option I noticed in this thread was to simply tape over the expansion joints when applying the epoxy layers. Yes, this will show a defined gray line that creates a giant plus sign but aesthetically I think I can use that to my advantage. Any considerations to this second idea? I guess the take needs to come up fairly quickly before epoxy hardens. Great site!!! Thanks for all the valuable info!! You could do that if that is what you like, Matt. And yes, you can’t leave the tape down too long once you epoxy over it. With the filler already in the joint, you can just grind everything flush and just coat over it as well. The risk may be higher for the coating to crack, but it’s still not a high risk. Just the potential for it happening is increased. FYI – Quikrete stated they do not test for or have any data on the “Elongation/Flex Rate %” for either “Epoxy Concrete Repair #8620-49” or “FastSet Concrete Crack Repair #8650-69”. Thanks for the info on that, Matt. Hello John. Unless you have very wide joints (greater than 3/4″), you can fill the expansion joints with SikaFlex or a similar self-leveling polyurethane sealant. We suggest slightly overfilling the joint. If you fill the joints with a polymer-modified cement to make the transition smooth, you will get cracking at the joints when the slabs get some movement from expansion and contraction as they heat and cool off. I have a tube of Vulkem 116 polyurethane caulk. It’s worked well for other concrete application, do you recommend using it to fill cracks and then applying my epoxy coatings over it? Hello Grant. No, you do not want to use a polyurethane caulk. It is a sealant and not an actual repair product for cracks. The problem is that it is too flexible and cannot be sanded or ground down smooth. What you need to use is an actual crack repair product. These products are stronger than concrete and cure extremely hard. This allows you to grind the repairs flush so that they don’t telegraph through the coating. We have a page on garage floor repairs here that explains more. my 20×36 shop was poured in 2 stages with an expansion joint. I want epoxy coating so do I epoxy first then fill the gap with silkaflex? That’s correct, Shayne. The SikaFlex will adhere well to the epoxy coating. Though it’s not necessary, some like to tape the edges first before applying the SikaFlex so that it forms a nice even line along the concrete. Menards sells Akonaflex Pro “self-leveling expansion joint filler” and it is relatively inexpensive. Any idea if epoxy could be applied over this? Hello Nick. No epoxy cannot be used over this for a couple of reasons. The first reason is that the product states it is paintable only with water-based paint. Coatings will not adhere. The more important reason is that this is a flexible, non-sandable joint filler. It’s similar to SikaFlex. Epoxy is extremely hard and does not flex. If used over a filler like this, the epoxy can crack if subjected to pressure. Also, though it is self-leveling, it will not provide a flush finish for a seamless look if that is what you were thinking. Ah! I completely missed that it is only paintable with water-based paint! Do you know of any Sika-like product that is clear and in a similar price range? They don’t make the self-leveling sealants like that in clear. What are you trying to accomplish? I applied a solid, light gray epoxy coat on my basement floor. I would like to fill the control joints with something to prevent them from accumulating dirt. I could use a gray Sika flex or something similar but I’m a little concerned that the color will be slightly off and it will look weird. I was thinking a clear product may look better. I see. Fillers such as these cannot be produced in clear, so manufacturers tint them to look better. Actually, a gray filler will provide a nice contrast and doesn’t distract with an odd look. There is an image in this post here about RockSolid where a reader used SikaFlex to fill joints on his gray colored floor. Interesting. I thought it was weird that I could not find a clear filler. That RockSolid floor does not look bad at all! I’ll give it a go. Thanks! We have a stucco floor in a veterinary clinic that needs the expansion joints filled and needs to be hard enough for pet claws not to penetrate it and can sustain daily mop cleaning. Any suggestions on what filler to use? Hello Tracy. We suggest using a self-leveling polyurethane sealant. SikaFlex is an example. It is a flexible sealant for joints that is water proof when it cures. Though it is flexible, it is extremely tough and pet claws will not affect it. SikaFlex is only available in gray and sandstone (tan) and you can generally find it at your local home improvement center. There are companies that offer multiple colors, but it is much more expensive. What is the best bond breaker to put on the floor before application of the polyurea, so that way it will come off of the concrete! Hello Dustin. I’m a bit confused here. Why would you want to apply a bond breaker to encourage peeling? Should you fill the joint before or after you acid wash? Hello Joel. If you are filling the joint to create a seamless look for a coating, then it doesn’t matter really. The proper material used to fill the joints is not affected by an acid etch. Typically you etch, fix any cracks or fill any joints and then grind all your work flush. But you can do it in the opposite order if necessary.